1) Pat chicken dry with paper towels. Dust the tops of the chicken with light coating of flour. Season with salt and pepper. 2) In a large pan, add the chicken and sear both sides until golden brown. Transfer to large dish and set aside. 3) Set to medium heat. 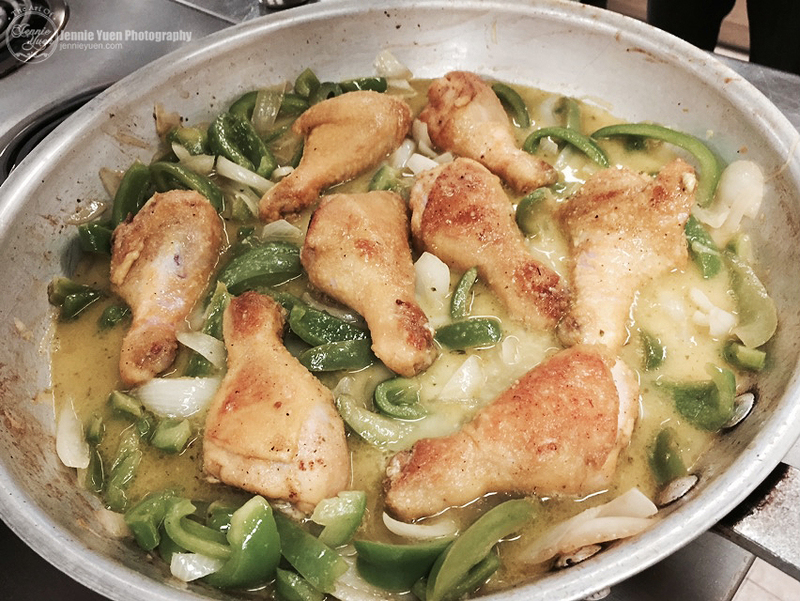 In the same pan that was previously used, add peppers, onions, garlic, and Dijon mustard. Cook until vegetables begin to soften. 4) Increase the heat to high. Pour 1/4 cup of white wine vinegar and cook until most of the liquid has been evaporated. Scrap bottom of pan to loosen any brown bits that have formed. Add the seared chicken drumsticks. Then add chicken stick and bring to a boil. Reduce heat to a simmer, cover and cook for about 30 minutes until meat can be easily pulled apart. 5) Serve with cooked white rice.